All HubSpot marketing accounts come equipped with two default subdomains, [your Hub ID].hs-sites.com and [your domain].hs-sites.com, which can be found in your domain manager. You can choose whether or not you want to display these system domains, in your domain manager. Select Domains & URLs from the left sidebar menu. Scroll to the bottom of the Domains tab and click Advanced settings. Toggle the button on to display your system domains in the domain manager. With this option enabled, you will see your system domains listed with your other connected domains. These subdomains are unique to each HubSpot account. These subdomains cannot be removed from your account. Although they may be found by search engines, hosting your content on these subdomains will not benefit your SEO as they are HubSpot subdomains. You should connect your own subdomain to host your content. Learn more about connecting your own subdomain here. Some users like to use these subdomains to host their content temporarily, then move their content to their own subdomains later. However, it is not necessary to ever host any content on these subdomains. For an alternative to temporarily hosting content on these subdomains while customizing your design, check out Content Staging. 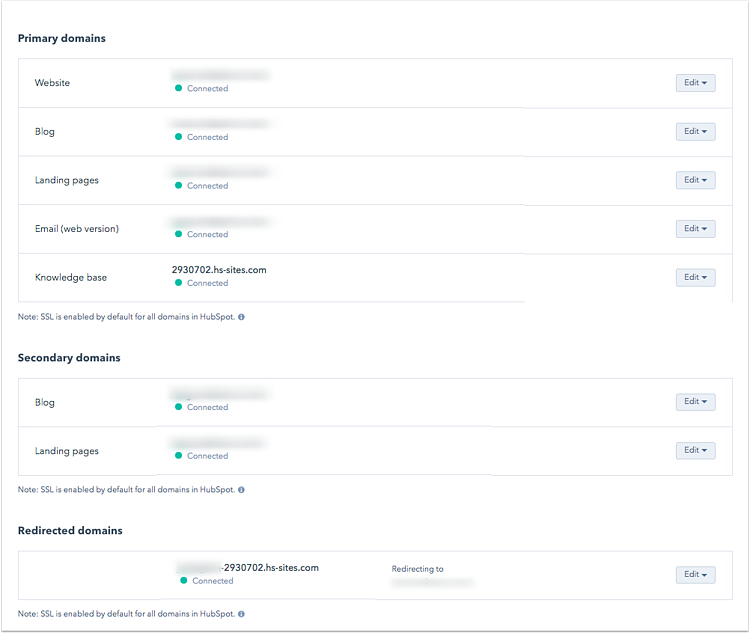 These subdomains are a fail-safe in the event that your connected subdomain(s) is disconnected from HubSpot. If you change domain hosts and have temporary downtime or if you don't renew your domain in your hosting account. Your content can continue to live on these subdomains until you successfully reconnect your subdomain(s).